Silence is all around. That is with the exception of the odd cockerel in the distance and the river passing downstream. We’ve just arrived at Touda EcoLodge where we are welcomed with a mint tea (the first of many) and a big smile from the staff from the village. It’s springtime and Said, the owner of Touda EcoLodge, reminds me that it’s been a difficult winter, one filled with cold temperatures and severe snowstorms. But harsh winters have lead to green pastors where locals are working the land and fruit trees are in bloom. 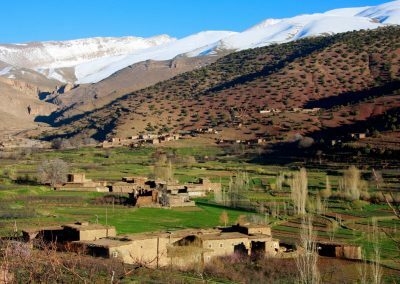 For shelter, clusters of mud brick villages dot the valley, a valley that seems completely cut off from the outside world. In fact, I cannot help but wonder if the locals who’ve never left the region even realize that there is a world beyond the valley. Or if they even want to know about what’s happening beyond those rugged peaks given the international news headlines these days. 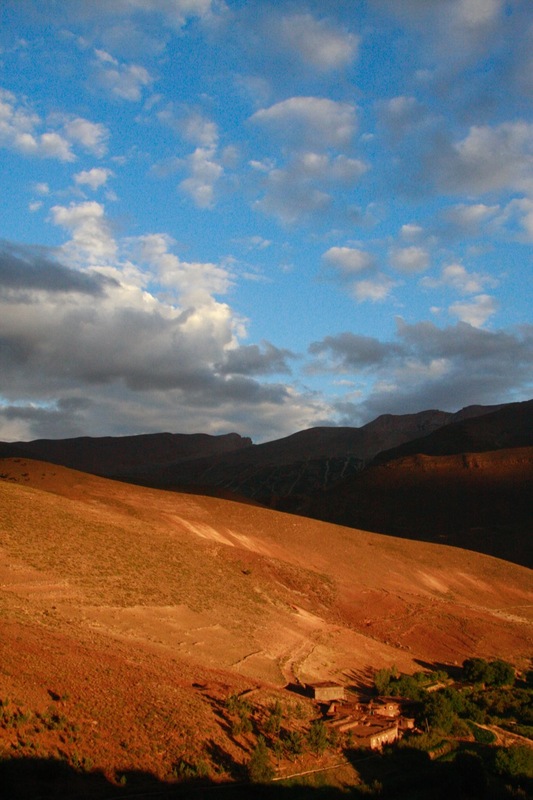 Given its remote location and distance from Marrakech, travelling here takes about four hours by car despite the actual distance of 250 kilometres. 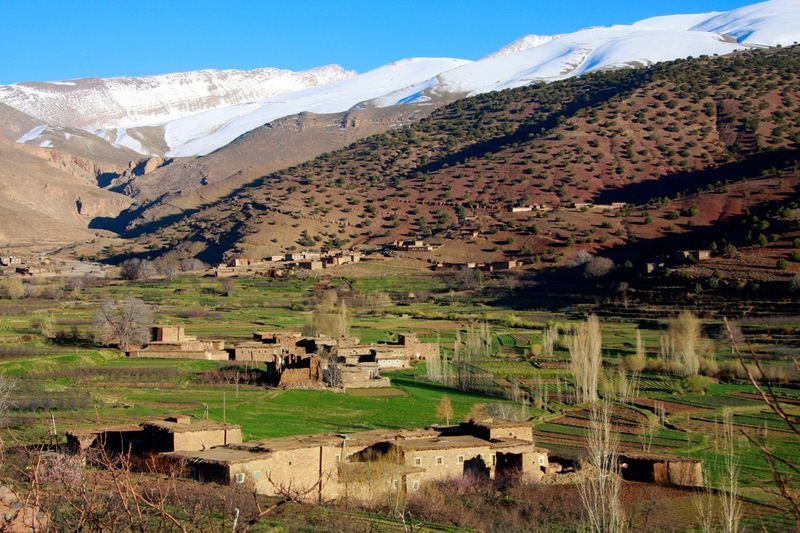 As we made our descent in to the Ait Bougmez Valley, a place I had been dreaming of visiting for years, I instantly relaxed, grateful that I would be staying for one week. Because I could feel it truly was a place to unwind. And time was needed to appreciate and enjoy the natural beauty. And with little mobile phone and Internet connection, an imposed digital detox awaited me. With landscapes so lush and beautiful, it’s not hard to put down the phone and soak up the views. Mud-brick houses with only a few satellite dishes provide a stark contrast from Marrakech and dirt roads dotted with centuries-old kasbahs are ripe for exploring. Rosy-cheek children are keen to say hello. 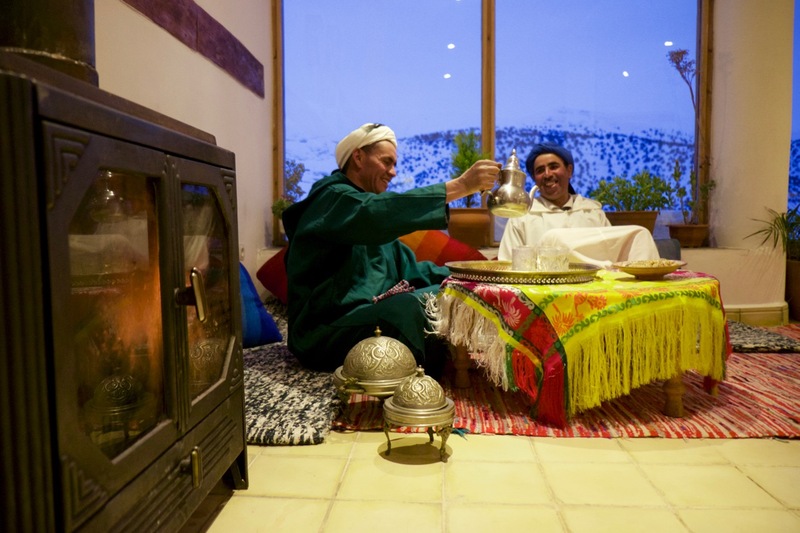 And the hospitality the Berber people are known for is second to none. The tribes inhabiting the region seem to be open and accepting to outsiders, and go out of their way to welcome them in to their tight-knit community, something I would learn more about during my week-long stay in the region. 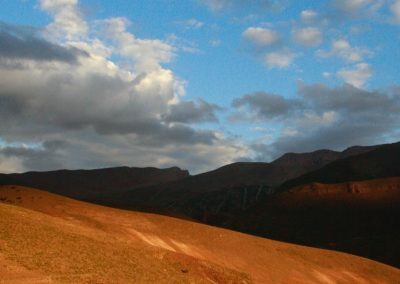 Said was correct when he explained “there are mountains everywhere, but the opportunity to interact with locals and learn about a new culture make it unique”. A stop at a local home for tea allowed us to witness the carpet-making process, a trade reserved for women. Tea in a traditional Berber home high up in the Atlas Mountains provided not only a much-needed tea break, but also a glimpse in to traditional domestic architecture. Over a piping hot delicious tagine (also the first of many) we discuss the itinerary for the week along with things to see and do. 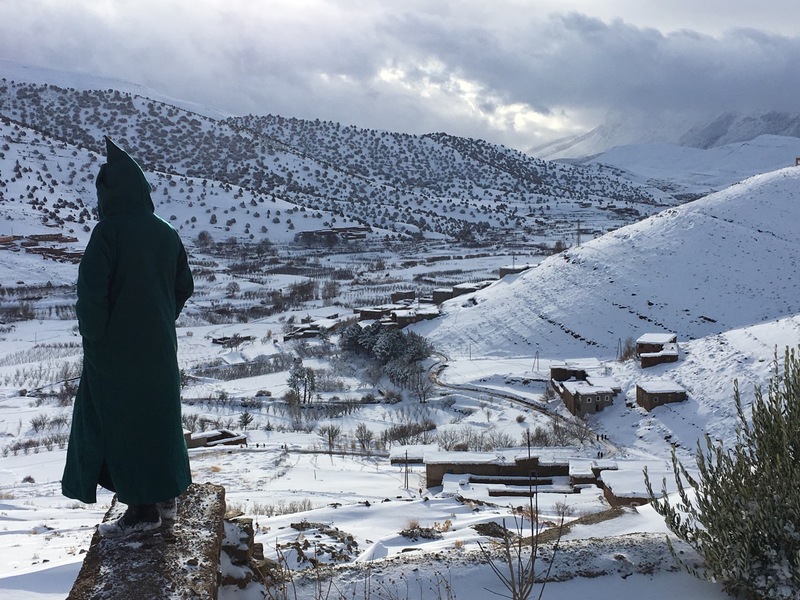 Trekking to a glacier lake where Ait Atta tribe graze their herds during summer months; hiking up to Sidi Mosa Marabout where the now-deceased saint is said to still assist women with fertility and marital problems; walking in the footsteps of dinosaurs; and even a market day. 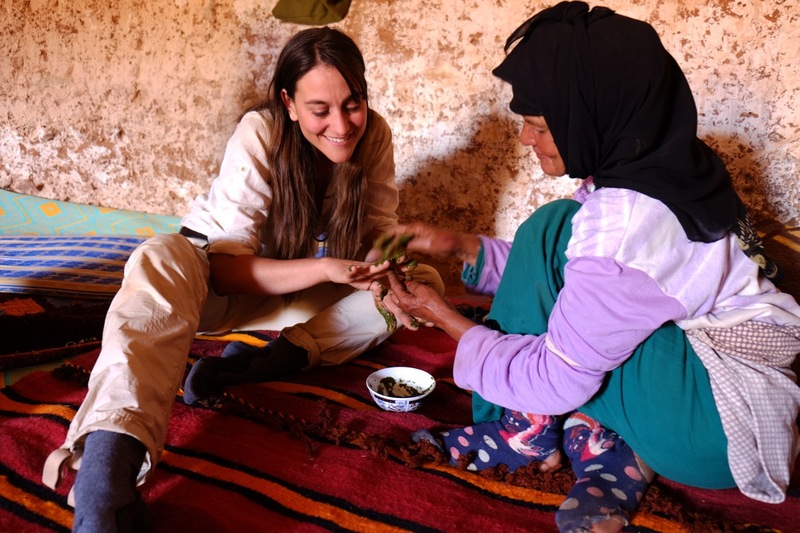 To truly appreciate the destination and given the time required to reach the guesthouse, a longer stay allows for greater appreciation not only of the landscape, but a deeper understanding of the Berber culture, way of life and traditions. With hosts and hostesses so friendly, I immediately felt part of the community and didn’t want to leave. And with few notifications on my mobile phone, I was able to completely unwind. As I tucked in to bed at night under layers of warm blankets, the sound of the brisk mountain wind outside, I fell asleep each night to the silence of the valley rather than the blue light of a phone!